I was out with my camera the morning of December 1, just to get outside. The weather was warm, grey, and spitting snow; not great light for photography! I was hoping to find something to photograph but was not having much luck. As always I was paying attention to the bird life as the annual Christmas Bird Count was coming up. I was focused on the American Dippers feeding along the waterway when a gray bird popped up into the shrubbery. My first reaction was: Dippers do not land in trees. Sure enough I got a better look and realized it was a blackbird. My camera was ready and I wanted a positive ID. As I looked through the viewfinder I realized the expected birds: Cowbird, Brewer’s Blackbird, or Red-winged Blackbird were not the case. 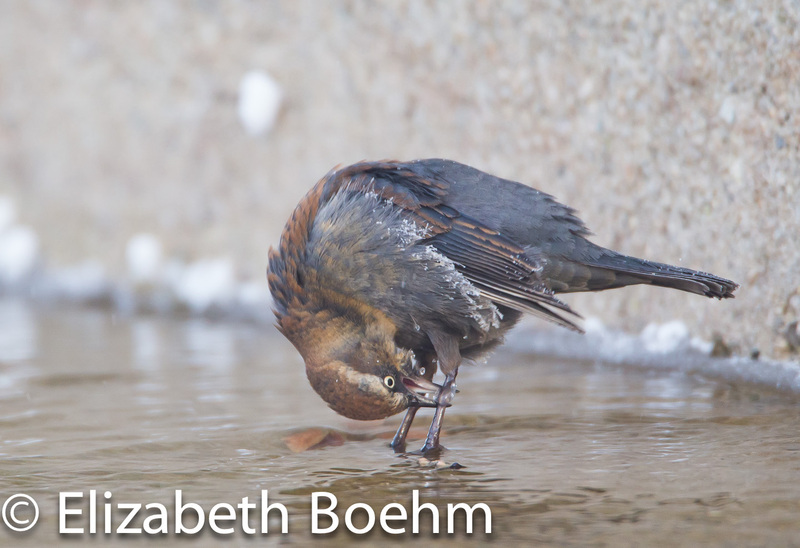 I took a few quick photos for ID purposes and returned home to find I had come across a Rusty Blackbird. A “Lifer” for me and a rather unusual bird for the area. I returned for several mornings and found the blackbird feeding on aquatic invertebrates in the open water of the irrigation ditch. He was very cooperative with this photographer, even coming too close for my lens’ 15 foot focus limit. The weather was relatively warm but the weatherman insisted cold was imminent and by the third morning the temperature dropped to -2. The blackbird continued to hunt for his breakfast not seeming to be fazed by the cold. 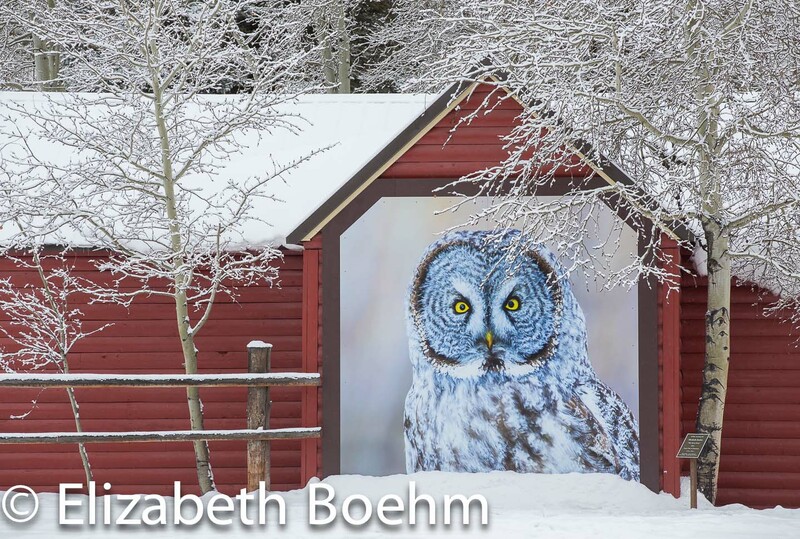 He stopped on occasion to shake the frost from his feathers and pull the ice from his legs. I had the pleasure of spending a number of hours observing and photographing this bird. I have since researched this bird and found it was very abundant in the first half of the 1900’s and prior. 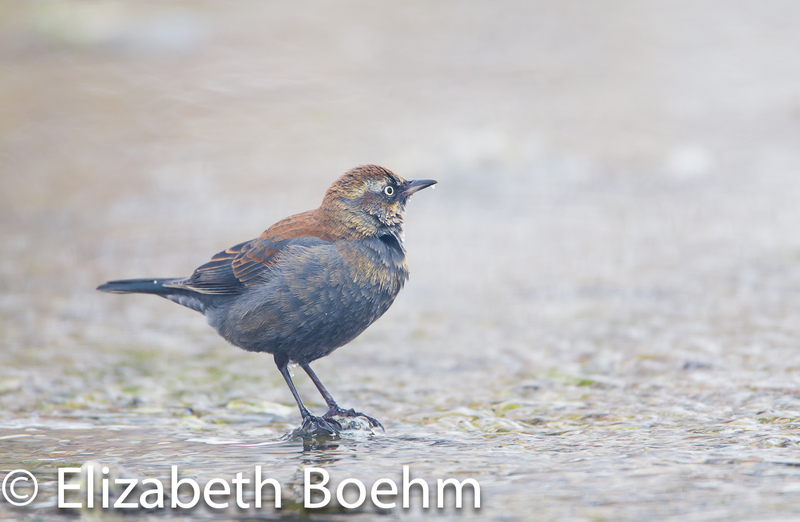 According to Arthur Bent’s 1958 Bulletin which includes the Blackbirds, “the ‘Continental Rusty Blackbird’ spring migration is spectacular, noisy, and ubiquitous: the birds may be seen in enormous numbers almost anywhere”. Since then the species has taken a sharp decline and research is now being performed to find the reason why. 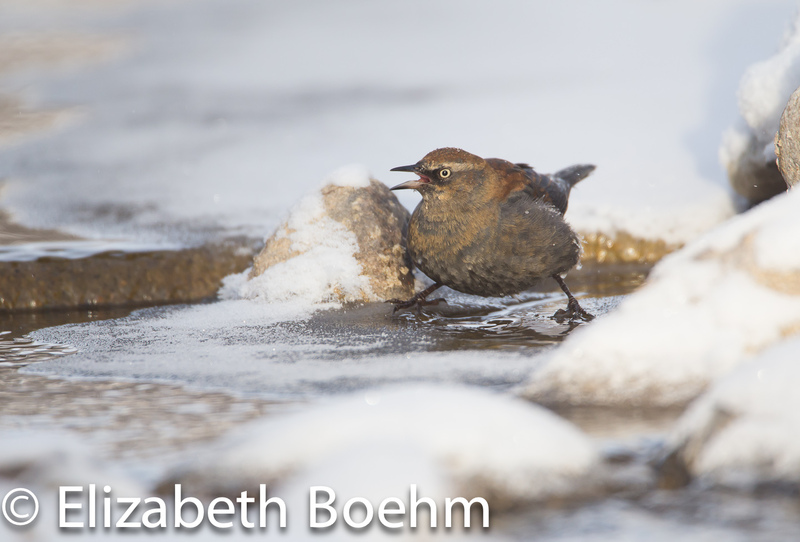 The Rusty Blackbird is typically an eastern species wintering in the Southeast and migrating into the boreal forests of Canada and the northern US for breeding season. Unlike other blackbirds it frequents wooded, swampy areas, beaver ponds, and shrubby shorelines. I returned this morning to check on the bird. We had had a number of days in which the nighttime temperature dropped to -20 and below barely making it into the single digits during the daytime. I had my hopes high that this small bird would be very cold tolerant and survive this blast of winter. Sure enough there he was in a small opening of water in the ditch. He flew over to the creek which parallels the irrigation ditch. This creek will stay open all winter boosting my hopes that he may hang around for the winter or at least until our annual Christmas Bird Count.